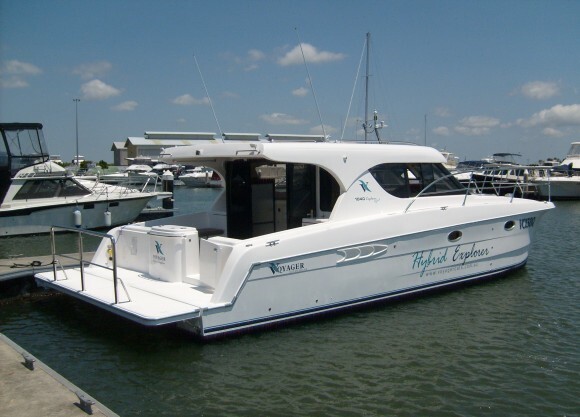 "Voyager" Power Catamarans represent the latest developments in G.R.P. High performance offshore cruisers and sports cats. An obvious benefit of the very efficient design and low fuel consumption is also the much lower pollution generated, but a less obvious one is the important reduction in the erosion of river or estuary shores from the very low wash (not to mention the comfort of other waterway users). Voyager are also involved in development and production using Electric/Diesel Hybrid drives, which have received huge interest due to their ability to run in silent electric mode in marinas, or pollution sensitive areas, but switch to diesel mode on open seas and longer voyages.